In private aviation the tastes and preferences of the most discerning clientele must be catered for. Flight Attendants and onboard staff working working on private aircraft in this sector require an exceptional level of professional and service skills which require constant evolvement. 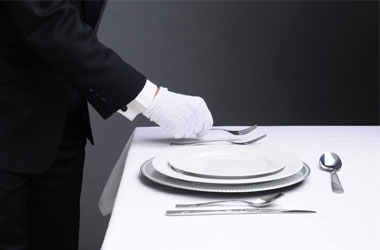 The Service Masterclass is a Butler level service training course, focusing on etiquette and service protocol. It is ideal for corporate flight attendants or staff tasked with working onboard their employers private aircraft. Our Hospitality and Service Trainers who deliver this course serve as Butlers in exclusive residences and have served as footmen in Buckingham Palace serving members of the British Royal Family. We also have visting lectures from exclusive luxury brand suppliers to develop product knowledge and update on the latest trends and innovations. The Service Masterclass training course is a Butler level service training course for flight attendants working on corporate jets or for personal staff working onboard their principles aircraft. It is ideal for those who wish to finesse their service flair and professional skills whilst learning the learning the latest in contemporary technique and modern trends. We also deliver the Service Masterclass to a number of aircraft operators. This particular course can be tailored to the bespoke requirements of aircraft operators and flight departments, who are looking to update and enhance their current level of service delivery. The Masterclass combines the best of service training and hospitality aswell as contemporary culinary technique. Our hospitality and service trainers serve as Butlers in exclusive residences and as former footmen in Buckingham Palace serving members of the British Royal Family. All attendees will learn the latest from industry experts and experienced VIP trainers as well as participating in hands on practical sessions. We also have occasional guest speakers from experts in their chosen fields and exclusive purveyors of luxe items. The corporate flight attendant is responsible for the guest experience. This course aims to ensure anybody who attends is able to set themselves above the rest by ensuring the service they deliver is nothing but exceptional. Kieron our hospitality trainer served as footman to members of the British Royal Family for many years and has served in many exclusive residences around the world. His knowledge of service, standards and etiquette is second to none. Neil and Aaron from Air Culinaire will be teaching the culinary and plating sessions, focusing on hands on technique, modern trends, emergencies and hacks to make any catering presentation truly exceptional. Duncan is a wine trainer and sommelier – he has worked in Michelin-starred restaurants in the UK. He will be teaching our candidates about food and wine matching and introducing them to the world of wines. To book a place on this training course contact Corporate Flight Training by email: info@corporateflighttraining.com or use the online booking facility. The course cost is 700.00 for an introductory period. For further information please contact the office directly. info@corporateflighttraining.com or +44 208 7983162.